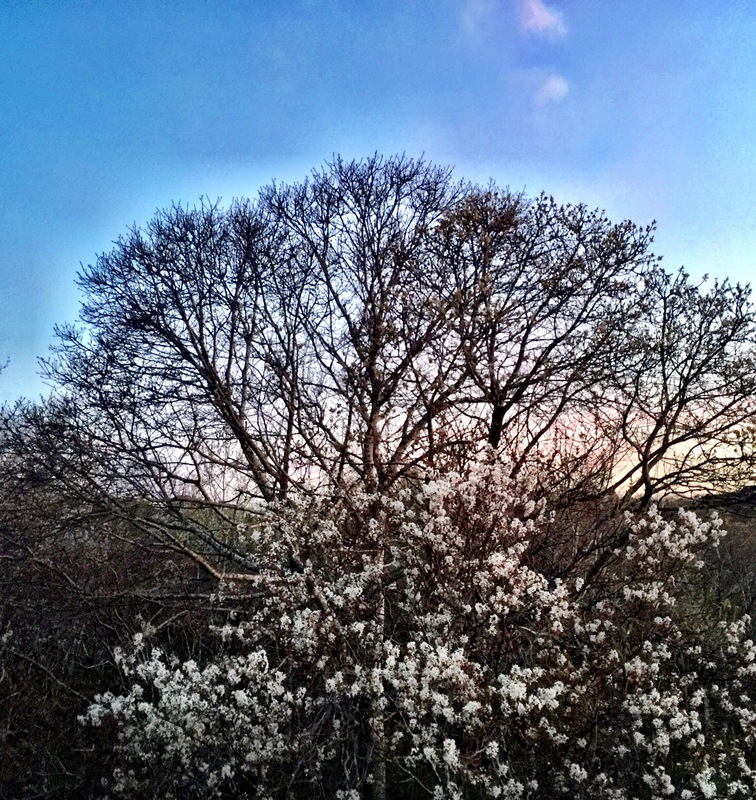 From my balcony, two floors up, I can see the tops of the spring flowery trees, all white and cloud-like. Some have bright green leaves and others are reddish bronze. I want to reach out and snap a few of these candy tufts to place in a vase at my desk as I write. Why? Because they are so abundant and joyeous, and oh so temporary. I can’t reach out and grab them, for they are out of reach, and these trees are much further away than my eye believes. The checkered fritillaria are blooming, and the snow drops are tiny, smaller than previous years where the blooms were heavy like hanging jewels. A scattering of muscarii, peeps of stray tulips. I rescued a rununculus from Shop Rite–wouldn’t you? Potting it up in recyled soil, I uncovered two intact dahlia bulbs from last summer. All in all, the garden is waking up, stretching. And this morning, a thoughtful neighbor anonymously left a tulip on everyone’s car. Mine is a pale pink, happily resting in a milk bottle filling up with the afternoon rain. The rain started and the cold came in this evening. It is late October, but the morning glory persists, and the nasturtiums haven’t quit. I am eager to dig up the absynian gladiolus, so I can try to over-winter them in the back of the garden. It was a good season, with many surprises, much drought, but in truth, I didn’t tend. 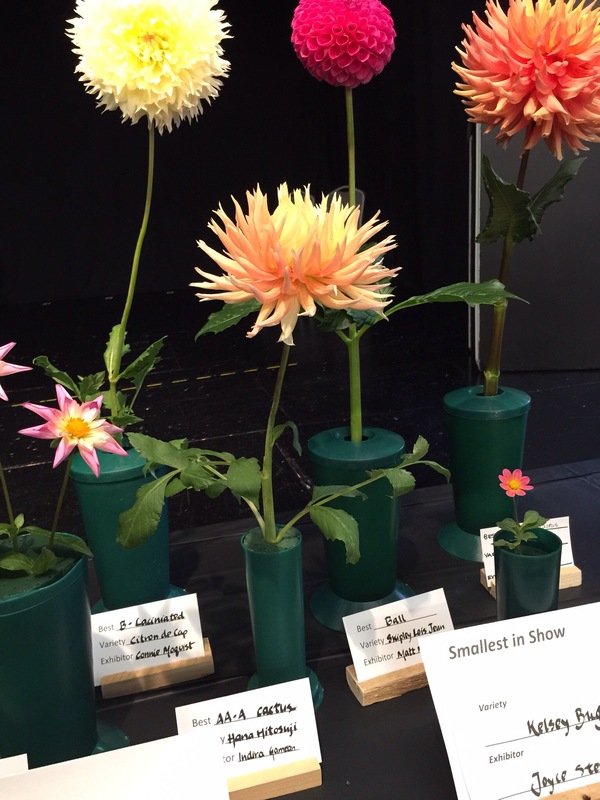 It was a good year for the dahlias– so good that I placed in two winning categories in the Novice division as the annual show. The roses faced rust, but bloomed. Hummingbirds visited daily for a while, and honeybees feasted on lavender and oregano. In the back, Iris Lorelei raised its colors, and I supped on home brew kumbucha and backyard honey, and tea from France with friends. I am ready to put the garden to bed, think about spring bulbs, daring myself to order some, while thinking too how much I need to edit the garden, pare down,revise.